Estimate all sound power sources. Enter the manufacturer's sound power data or calculate the fan sound power. Add safety factors - 3 dB is recommended. Estimate the attenuation in the system. The sound pressure levels - Lp - are converted to sound power level - Lw - at the terminals. The acoustic characteristics of the room as well as the number and location of the terminals must be considered. a) Determine the acoustic characteristics of the room. In this example an average sound absorption for the room is used. b) Determine whether the receiver are in the direct or reverberant field. In the example the listener is approximately 1.5 m from the terminal. c) Find the rooms absorption characteristics. In the example the absorption for the walls, ceiling, floor, persons, curtains and their areas, is calculated to 30 m2 Sabine. According a) and c) the attenuation is 8 dB. d) Determine how many terminals the listener are influenced by. Note! Remember to include supply and return fans. In the example the listener are influenced by two terminals. From c) we subtract 3 dB. The attenuation from the terminal to the room is 5 dB. The values are entered in the example. In the example the duct dimension is 250 mm. Attenuation due to end reflection is entered below. Calculate the attenuation in unlined and lined ducts. Note that the table and diagrams list the attenuation in dB/m. Calculate the attenuation in the elbows. Determine the allowance for split - branch to terminals. Determine the allowance for split - main duct to branch. Add attenuation from other components. Determine the sound pressure level criteria. This table indicates acceptable levels at different locations. Check against domestic rules. In the example below Noise Rating - NR30 - is used as a criterion. NR-values are entered in line 1. The silencer must be selected to provide the necessary attenuation. Manufacturer's data are preferred. You can save and modify your own copy of the example if you are signed into your Google Account. Engineering ToolBox, (2003). Acoustic Calculation of Ventilation Systems. 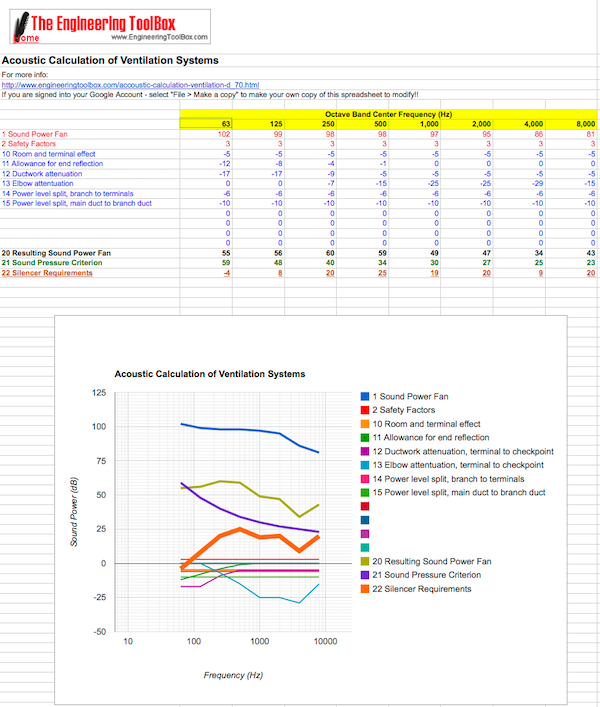 [online] Available at: https://www.engineeringtoolbox.com/accoustic-calculation-ventilation-d_70.html [Accessed Day Mo. Year].